A percolation test measures how quickly water drains away from the soil. The results from the test allow a drainage engineer to decide if a soakaway is suitable and if so, recommend the correct size. If provided with test results, our team will provide the necessary calculations for a soakaway without obligation. 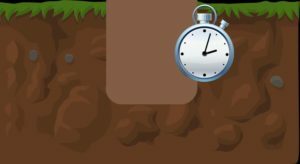 The testing process is simple- dig a pit to specific dimensions, fill the pit with water, and time how long the water takes to soak into the soil. A handy step by step site guide can be downloaded HERE. 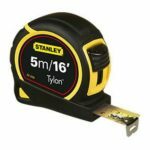 Please note there is a charge of £50.00 ex VAT for the calculations. This figure is deducted from the order value once the order is placed. Make sure your site is suitable. 2.5m away from any boundary. NB: Due to size constraints, developments in urban areas are sometimes not large enough to use a soakaway. 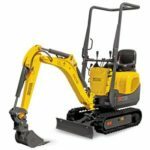 In many cases, sites with a high water table or a heavy clay content will also not be suitable. 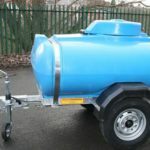 If you can demonstrate your site is not suitable to accept a soakaway, contact one of our sales team who will be able to provide some alternative options. A method of digging holes of considerable size. A source of water. NB large volumes are required for percolation testing. Each test can use in excess of 200L. Either a hosepipe or a water bowser. Each pit should have a minimum footprint of 0.3m x 1m. 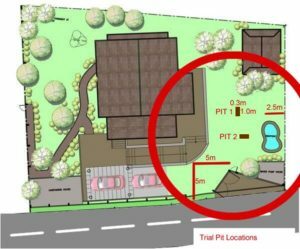 A minimum of two trial pits are required within location of the proposed area for the soakaway. NB: Make sure the proposed locations adhere to the rules above regarding proximity of soakaways to buildings, roads and boundaries. 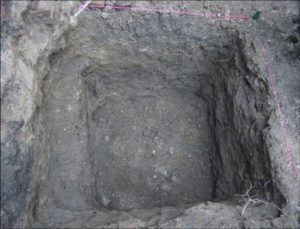 The depth of the pit should be 30cm lower than the depth of the soakaway once installed. If this is not known, a depth of around 1.5m is typically sufficient. Dig the pit to full depth, squaring off all edges. 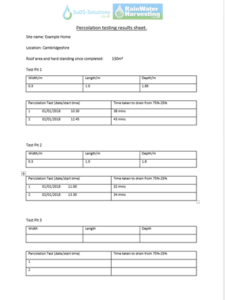 Make a note of the dimensions of your trial pits on the provided results sheet. NB: If the water table is hit during the excavation, a soakaway will not be suitable. Contact one of our sales team who will be able to provide some alternative options. In preparation for timed testing, the test pits should be completely filled then left to drain for 24 hours. If the pit has not emptied completely after 24 hours, a soakaway is not suitable. Contact our team for advice on other options. During the timed testing only the volume between the top 25% and the bottom 25% are taken into consideration. Calculate 25% of the depth measurement. 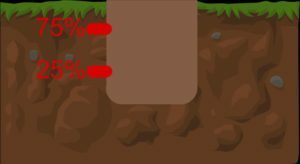 Measure the depth of the pit then divide by 4. For example a 1.6m pit = 0.4m. Clearly mark the pit 75% and 25% by scoring the pit wall or using line paint. NB: Markings must be clear during the testing process. Filling should be as fast as possible without causing damage to the walls. 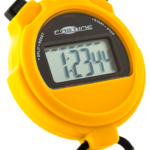 Have stopwatch ready for when the water level reaches the 75% mark. Begin timing when the water level reaches the 75% mark. 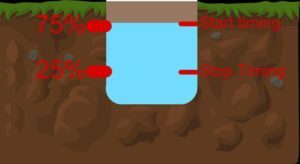 Stop timing when the water level reaches the 25% mark. Make a note of the time taken on the sheet provided. Before starting each test, ensure the pit is completely emptied. 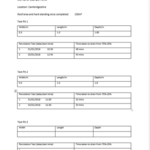 Ensure you make a note of the time taken on the sheet provided. A minimum of 3 tests are required over a minimum of 2 pits. Some authorities may request more tests or more pits. Check first with your local planning authority. Send us the results for drainage calculations. By providing the raw data, one of our team can convert the test pit size and drainage times into a percolation rate. By providing an approximate figure for the impermeable area of your development (roofs and driveways) and your geographical location, our team can provide a no obligation quotation for a soakaway. If you would prefer to run your own calculations, details are available in BRE365 Soakaway Design Digest. Our company always advise the use of modular ‘crate’ soakaways. Rainwater Harvesting Ltd accept no liability for loss or damage whilst using this guidance. If unsure, seek specialist advice. 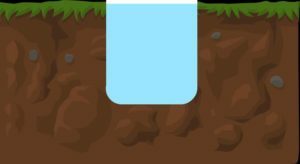 What is a soakaway? A Soakaway is an area underground where rainwater can infiltrate into the soil. Why is proper percolation testing important? When building you must insist a percolation test is completed. From our experience, it is also not uncommon for builders to build the soakaway too small in order to save some time. This will cause it to fail. At best expect a boggy, flooded, garden. At worst you could have dirty surface water flooding your home and causing damage. Why use ‘crate’ soakaways rather than a traditional rubble filled pit? Firstly the soakaway can be smaller in size (as there is lots of space in the crates to receive the water in comparison to broken rubble.) Secondly, it forces your builders to build the soakaway to the correct size (see above.) Crate soakaways are also less likely to silt up and fail, reducing costs down the line. Who can’t use a soakaway? 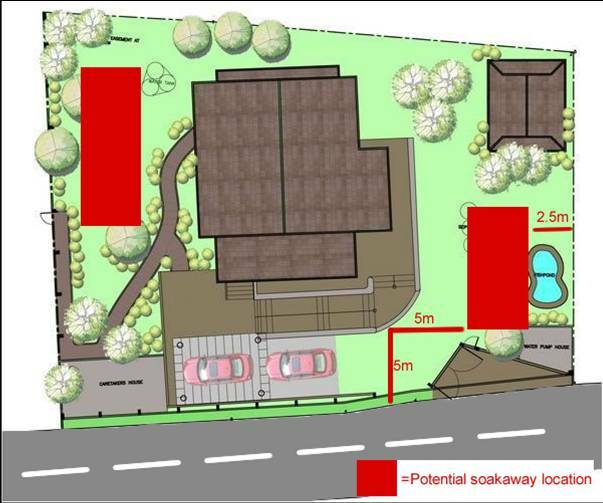 Small sites that cannot meet the rules regarding the proximity of a soakaway to a development, road or boundary. Plus areas that won’t ‘soak away’ due to heavy clay, or high water table. What are SuDS? SuDS systems? sometimes refered to as ‘storm attenuation’ reduce the rate of water entering the drainage system. Thus preventing it backing up and causing flooding. What systems are available? Controlled attenuation systems such as Rain Activ™ are the most cost effective and simplest method to have passed by planning authorities. Rainwater Harvesting and Rain Gardens, are considered good methods for domestic developments but can be difficult to supply the required calculations. What is Rain Activ™? Rain Activ provides simple, cost effective, SuDS for smaller sites at a fraction of the cost of traditional systems. Stormwater is passed through a self cleaning filter and held within a tank. The water is then released slowly through a small calibrated orifice to control the flow. All planning authority calculations are provided. Unlike any other SuDS systems, Rain Activ can be easily combined with rainwater harvesting and provide a payback.